EDIT 07/20: Please take a moment of silence to pay respects to those lost in the shooting that took place in Aurora (~30 miles away from Boulder) last night during one of the premieres. A man entered a theater and released a tear gas canister into the auditorium, then began shooting. As of this morning, 12 have been reported dead and many others have been left injured. Read more at MSNBC. If you would like to offer donations to those affected, please visit the American Red Cross Mile High Chapter to offer aid in light of this disaster. My thoughts are with those families today. Na na na na na na na na, na na na na na na na na, na na na na na na na na NAILED IT! If you've been living under a rock or for some odd reason don't like movies, then you're unaware of what this post may be about. Let me enlighten you. 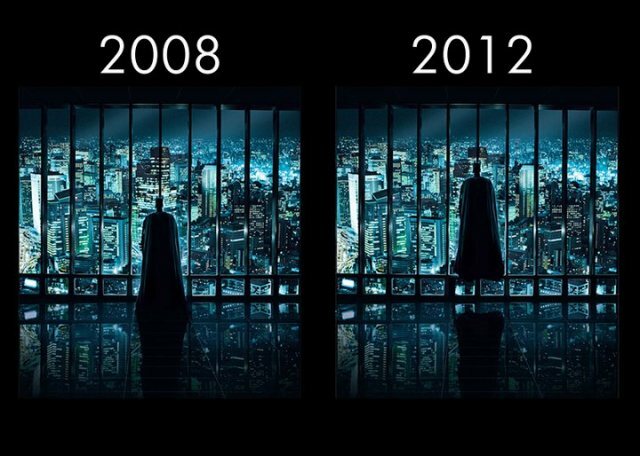 Tonight in select theaters there will be midnight showings of the new Batman movie, The Dark Knight Rises. It's going to be action packed, thrill-seeking, Anne-Hathaway-in-a-cat-suit-awesome! 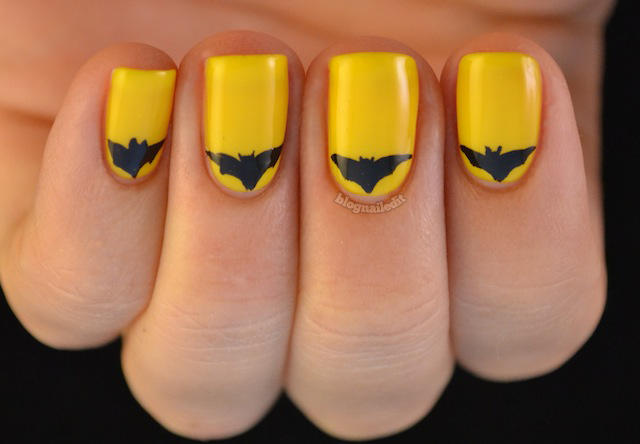 So I couldn't not do a Batmanicure. I can't contain myself. I originally felt some excitement for the movie, but wasn't overwhelmed with anticipation, but now I'm itching to get in that theater. 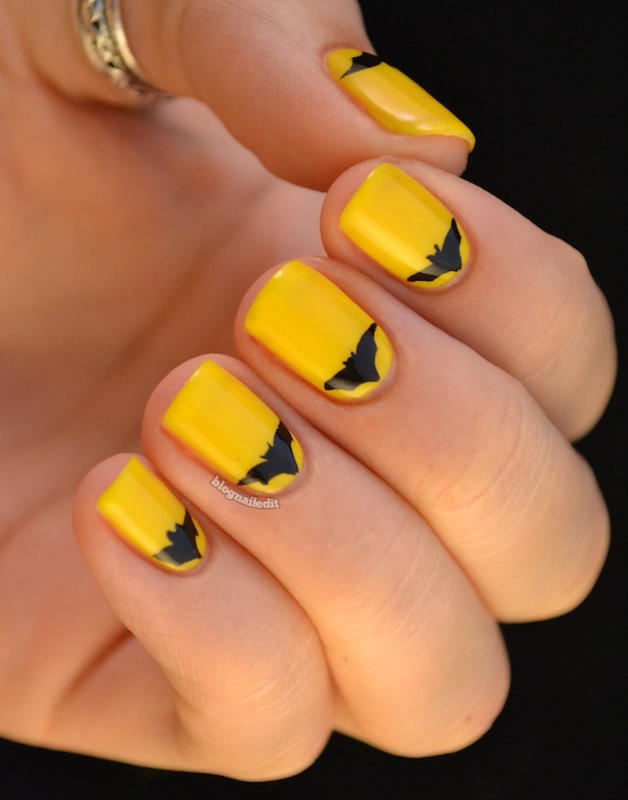 Though the Batmanicure isn't really with the theme of The Dark Knight Rises (he doesn't really sport the bright yellow of his predecessors), I couldn't say no to a yellow. This one's Need Sunglasses? (OPI). Each little Batman symbol was done freehand with my favorite striping brush, Black, from Color Madric. Just for fun here's quite possibly the best promo I've seen for The Dark Knight Rises. I love it, you did an amazing job. I'm pretty dying to go see the movie! You are awesome! They look absolutly fantastic! So cool! At first I thought the bats were stickers. Nice work. I wanna see the new batman movie too but it'll take ages til it comes here. Cool, i know a lot of people anticipating this film!! wow! what a great mani!!! I LOVE THESE! The movie was so awesome. So, I know it sounds like you live near Boulder, but after hearing about that shooting in CO, I got worried about you. Just checking to make sure you are ok. I love the manicure, and saw it this morning when I woke up...when I heard the news about the shooting, you (a complete stranger, I know) were the first person I thought of. Hope you are alright and my thoughts are with the entire state of CO during this time of tragedy. This mani is awesome! Your bats turned out great! lmao I love that picture!